Nourish Knoxville runs 3 markets in and near downtown Knoxville, TN: Market Square Farmers’ Market (May – November), Market Square Holiday Market (December), and the Winter Farmers’ Market (January – April). All our markets are producer-only, meaning everything sold at the market must be grown or made by the vendor. 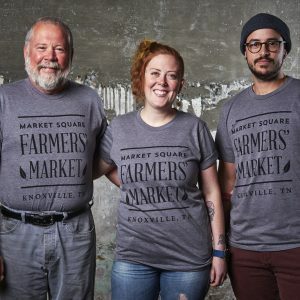 It is our goal to connect the farmers, growers, food producers, and artisans of the East Tennessee region directly with our community through direct access and educational opportunities. Please use the navigation to find information about each market. For additional questions, email [email protected].